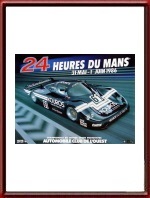 Vintage Original 1986 24 Hours of Le Mans Poster. May 31 & June 1, 1986. The 1986 Le Mans poster is part of the "The star car used for sponsorship" era in Le Mans posters which lasted from 1981 to 1997. 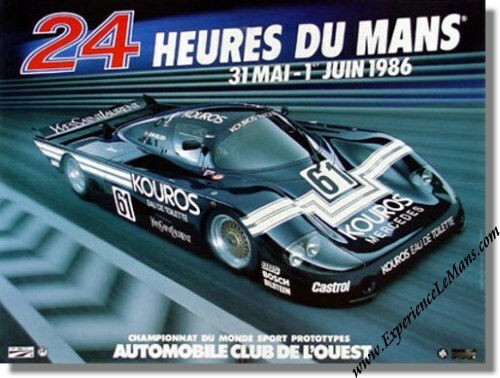 The production of the 1986 Le mans poster was in the hands of the S. Conseil agency who based their design on a highly life-like illustration of the Kouros Mercedes who was the sponsor of the 1986 poster. Despite starring on the 1986 poster, the car did not win the race... it blew its engine after 61 laps, at around 21.00H on Saturday evening. The race was won by Derek Bell / Hans-Joachim Stuck / Al Holbert in their # 1 Porsche 962 C with a total of 367 laps to their name. For the full results of this race, please see 24 Heures du Mans results 1986.